Blending style, performance and efficiency into one bold compact SUV, the Terrain rolls into the Valley for another year! 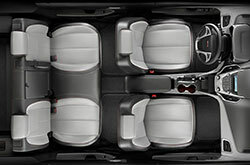 With lots of backseat wiggle room and entertaining connectivity features, the 2017 GMC Terrain in the Phoenix metro area is a great choice for families and avid carpoolers alike. While most features carry over into the new model year, SUV shoppers are sure to appreciate the shiny new wheel design and sleek monochrome appearance package which make the Terrain a stand-out SUV among the crowded streets of old town Scottsdale. Bold yet refined, the Terrain rivals luxury SUVs inside and out. The Terrain's fierce body design is complimented by eye-catching chrome trimmings and standard 18-inch aluminum alloy wheels. 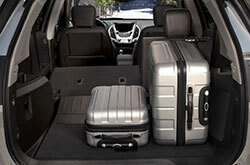 The cabin, designed with premium, high-quality materials, features a sliding rear seat that increases cargo space to a whopping 31.6 cubic feet with the seats up. With five trim levels: SL, SLE1, SLE2, SLT and Denali, users can personalize their comfort and amenities. 2017 GMC Terrain reviews are impressed with the standard tech features, which include a 7-inch touchscreen radio, OnStar capabilities and a built-in wireless internet hotspot. Starting at SLE-2, users will be treated to automatic climate control, an eight-way driver's power seat and a leather-wrapped steering wheel along with the Intellilink infotainment system. Available in FWD or AWD, the Terrain boasts two impressive engine options. SL and SLE-1 trims are equipped with an Ecotec 2.4-liter engine rated at 182 horsepower. Designed with variable valve timing and direct injection technology, the 2.4-liter engine offers impressive fuel-efficiency. Starting at SLE-2, buyers have the choice to opt for the 3.6-liter V6 that kicks out 301 horsepower. 2017 GMC Terrain reviews recommend the V6 for those looking to tow, as the SUV has a capacity of up to 3,500 lbs. when properly equipped. The 2017 GMC Terrain in Scottsdale is designed to tackle any challenge while providing passengers the utmost safety. Automatic grade braking, hill start brake assist and Stabilitrak stability and traction control are just a few of the great performance features the Terrain boasts. Additionally, all models of the Terrain come with a rearview camera and a six month trial of OnStar Guidance with emergency assistance. Optional on SLE-2 and SLT and standard on Denali are additional active safety features like forward collision alert, lane departure warning and blind spot warning with rear cross traffic alert. Visit our Scottsdale dealership to test out any of these features! 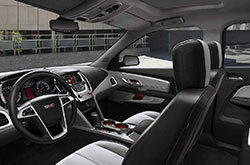 Want to Read More Info About the GMC Terrain? 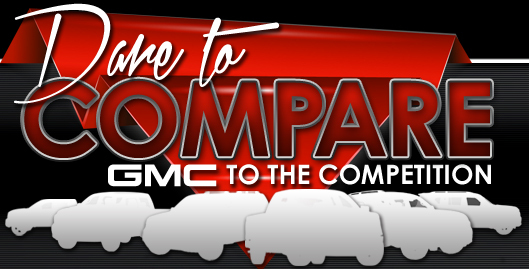 If you live in the Phoenix area and have been interested in a new car like the 2017 Ford Escape, Honda CR-V and the Kia Sportage, we advise that you take a prolonged look at the 2017 GMC Terrain. You could find that with its abundance of first-class features and up-for-anything persona, it suits your individual needs. Now that you're about finished with our 2017 GMC Terrain review page, make sure to check out financing incentives offered at Van Buick GMC! 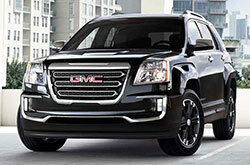 To see a superb selection of cars, come to us to find financial incentives on the inimitable GMC Terrain. 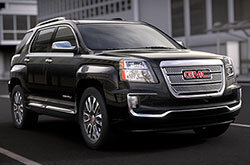 After reading over our 2017 GMC Terrain review, make note of the details that you found accessible; they'll help you make a responsible vehicle purchase that you won't later regret. 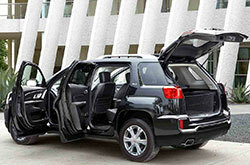 We have a enormous inventory of gorgeous GMC Terrain models in Scottsdale, AZ - drive one today. Would you like a chance to see it prior to your visit? It's no problem - checking out the embedded video walk-around will give you a peek at its full design from all ends.